Santa Roza Tower is centered around the new created square which connects Alasia street with Themistokli Dervis street. Santa Roza new created square is considered to be the fourth gate of Nicosia. The projects architects Atkins, worked closely with AISPD Ltd, to transform their vision into an exciting new Landmark in the heart of Nicosia. Great Care is taken to ensure that AIPSD Ltd, new building integrates into the natural surroundings and respects the environment. 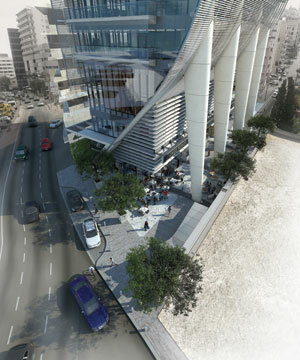 Centered, around the new square in Nicosia. Santa Roza, will include offices, luxury apartments, business club, retail shops, restaurant, as well as a public car parking. This new proposed prestigious address, should be practical and allow optimum space usage and flexibility.